Nutrition advice promising all sorts, from weight loss to healthier living and even cures for diseases, spread like wildfire across social media. In the era of ‘alternative facts’ and post-truth, ‘the latest, greatest nutrition advice’ from dubious sources can unfortunately tempt many away from accepted dietary guidelines and recommendations based on years of evidence. ‘Eat Fact Not Fiction’ is the theme of Dietitian’s Week 2017, highlighting the important role of dietitians who are able to interpret nutrition science and dietary guidelines in order to customise nutrition advice for each individual. This is vital because from weight loss to a disease like diabetes, there is no ‘one size fits all’ best eating plan. Dietitians happen to be health professionals trained and qualified to do this. Correct nutrition is also vital for Children with Cancer, as their immune systems are compromised due to the cancer as well as the treatments for cancer such as Chemotherapy and Radiation Therapy. It is therefore vital that all parents of Children with Cancer know what is important for their children to eat whilst undergoing Cancer Treatments. In the course of earning their degrees in the science of dietetics, dietitians are specifically taught the skills required to interpret scientific evidence. In order to maintain their professional registration with the Health Professions Council of South Africa (HPCSA), all practising SA dietitians also have to undertake ongoing studies that ensure they keep up with the latest knowledge provided by new and emerging evidence, in accordance with the Continuing Professional Development (CPD) programme. This means they have the latest evidence-based food, health and disease expertise at their fingertips – and you won’t find a registered dietitian in the country basing any recommendations on the long outdated food pyramid. The country’s broad strokes dietary guidelines, on which public health messages are based, and which were developed according to the process recommended by the Food and Agricultural Organisation of the United Nations (FAO), have also evolved over the years, featuring a notable shift from the emphasis on nutrients to the focus on actual foods, which by nature contain a variety of nutrients. ADSA, the Association for Dietetics in South Africa, provides further clarity on the guidelines with its statement on the Optimal Nutrition for South Africans. The latest visual Food Guide from the Department of Health provides a very different picture from older models such as the Food Pyramid and represents the latest FAO recommendations. But the reality remains that diet is highly personal. What we eat is rooted in our culture and tradition, shaped by affordability and accessibility, and inextricably intertwined with highly variable lifestyle factors such as weight, physical activity, emotional connection to food and our consumption of non-food substances, as well as various physiological differences and genetics. The role that the dietitian can play in helping the communities in which they work to secure healthy food systems that are good for both people and the planet is an emerging responsibility in the profession. Dietitians are increasingly involved in facets of our modern food systems including agriculture and alternative food production methods, natural resources and ecosystems, social justice and community health issues, as well as developing food policy and food systems research that takes sustainability into account. Some may associate dietitians with merely giving advice and support to someone who wants to lose weight, but dietitians work across a range of industries. They are also experts in providing nutritional advice with regard to serious diseases and conditions such as diabetes, heart disease, hypertension, liver disease, kidney disease, cancers, HIV/AIDS, TB, throat, stomach and intestinal disorders, as well as food allergies and intolerances, eating disorders, sports nutrition and life-stage nutrition (including the protection, promotion and support of breastfeeding as the best start in life). Apart from dietitians in private practice, they work in hospitals and communities, academia and industries. In addition to consulting with patients, dietitians are also involved in research, nutrition training and development of provincial and national policies. In South Africa, where the health issues that arise from the obesity epidemic stand side by side with those resulting from undernutrition, our dietitians’ work literally spans from one extreme to another. The South African Society for Parenteral and Enteral Nutrition (SASPEN), a supporter of Dietitian’s Week, highlights the essential role the dietitian plays in providing nutritional support to promote optimal nutrition to people in hospitals, where malnutrition is a common cause of the exacerbation of disease, delayed healing and prolonged hospital stays. It’s clear, that as a country, our need for dietitians is multi-fold, which explains why there’s a lot more than just dietary guidelines on the mind of a registered dietitian. In consultation, your dietitian is going to be taking in many factors unique to you to work towards helping you make optimal food choices. 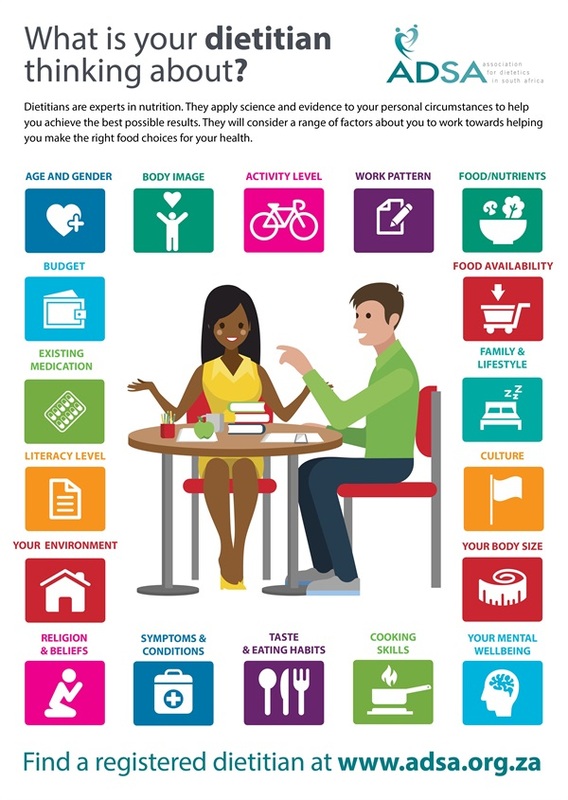 This includes your age and gender; your genetics, body size and body image; your environment, culture, spiritual beliefs and family life; physical activity level, mental well-being and general abilities; your work life and patterns; your budget; food preferences, eating tastes and cooking skills; as well as your existing health conditions and prescribed meds. In the hopes of steering us clear of the latest trumped up ‘diets’ and promoting a return to genuine expertise and evidence, dietitians countrywide are suggesting that we ‘Eat Facts Not Fiction’. In collaboration with the British Dietetics Association, Dietitian’s Week is held in SA from 12-16 June, with the 2017 theme ‘Eat Fact Not Fiction’.